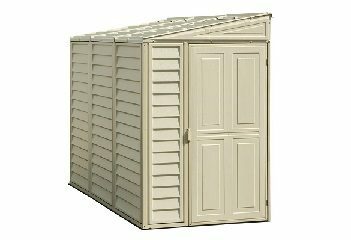 The durable and contemporary design of the Duramax Sidemate Shed makes it an easy choice when looking for backyard storage needs. Constructed of durable all-weather vinyl in Ivory which eliminates the need for painting, treating or maintenance. It features 62″ of height space and a 30″ wide door, boasting 154 cubic ft. of space. Built tough with metal reinforced wall columns. The Sidemate Shed installs easily in just a few hours. Add life to your shed by using the Foundation Kit. This foundation kit is crafted of galvanized metals, provides a base for installing your shed and ensures that the shed is square. The foundation also elevates your floor (plywood floor not included) off the ground. Please refer to the dimensions below before pouring the foundation. It is recommended to pour concrete at least 1 foot larger than the actual dimensions. The door may be reversed and placed on either side.